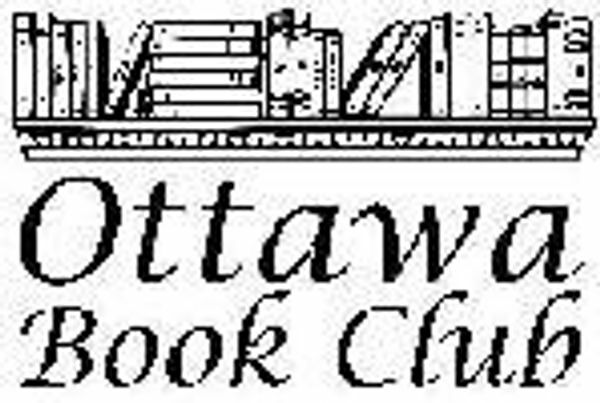 I'm not exactly what you call on the "cusp" of what is happening in Ottawa and the surrounding area, but my one comment to Barn Door Productions is that I didn't even know you existed!! Don't get me wrong... I'm glad I found you, but if a friend of mine that lives close to Perth hadn't made an offhanded comment asking if I was going to the Shakespeare play she "heard about" near her, I would still not know you exist! I don't know who does your advertising, and I'm sure it will come down to budgets and such, but every year I see ads and posters for more local companies like "Company of Fools" and "Bear and Company" then myself and some other book/Shakespeare geek friends make plans to see the shows, but I have yet to see an ad or lamp-post poster for you guys. But after the show I saw last week I am happy to add to your social media exposure if it helps more people know you exist and what you do. I've driven past this small playhouse called The Full Circle Theatre on Craig street in Perth many times over the years and never known what goes on inside. The inside seems far larger once you're in it and it is a lovely old wooden theatre that used to be a car wash many years ago. Two friendly ladies greeted me and took my ticket and in a very homey atmosphere they also offer pop, snacks and coffee. A wonderful atmosphere. 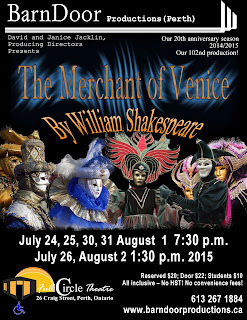 "The Merchant of Venice", after The Tempest, is another one of my favorite Shakespeare plays. I think I've always loved the "Law and Order" like feel of the final big scene and how Portia finds the loophole in the bond to save Antonio's life and thwart Shylock. Time for a flashback to high school... The biggest debate you will usually hear with this play is whether or not Shylock is a sympathetic character or not. Does he deserve his treatment? Does he deserve how he is left at the end of play; ruined, alone (abandoned and the victim of theft by his own daughter) and forced to switch to Christianity as punishment for asking that his bond against Antonio be honored? If there was ever a question in my mind, it was laid to rest this night with the performance of Joe Laxton who played Shylock. An excellent stand-out performance that convinced me once and for all that, though a little over the top in his wish for revenge, Shylock was undeserving of the treatment he was victim to before the start of the play. He was called dog and actually spit upon by Antonio in the market because of his beliefs. I loved the "If you prick us, do we not bleed?" speech which convinced me that Shakespeare was trying to buck against the accepted tradition of his time that being cruel to Jews was a good thing to do. And, not to put to fine a point on it, what kind of a genius was Antonio to sign a bond that allowed Shylock to cut out a pound of flesh, and then whine when the penalty for the bond came due? I feel sorry for Shylock. There was a huge "hooray" by the cast at the end of play as everyone ends happy ever after with their loves. Except for Shylock who lies on the ground... broken, alone, abandoned, and forced to disavow his religion. Antonio may not have "deserved" death, but neither did he warrant living happy ever after with most of his ships returned and granted half of Shylocks lands and fortune. There seemed to be some real chemistry between Portia and Bassanio, and it wasn't until after I got home and looked up some of the cast that I found they are actually married! The second stand-out performance for me was Kristy Angel who played Portia. I really enjoyed her and Narissa's banter and reactions as the suitors try to guess which of the 3 caskets contains Portia's picture. Well done guys. I'm glad I found you and I look forward to other productions. This is the second book I have had the pleasure of reviewing for Benoit. The first was The Calumnist Malefesto. I found Red Nexus well written and an interesting take on a familiar theme. 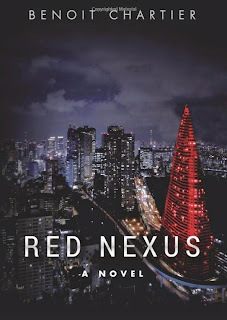 The story itself feels like a combination of The Matrix, Neuromancer and other such science fiction novels. readers are familiar with the theme of "virtual worlds" where users log in and feel like they are physically in these other worlds as they perform tasks, complete missions and suffer real physical consequences if they experience harm. We follow the life of Wen Harkwell who cares for his brother, Sammy, after the death of their mother. Sammy turns up missing one day and Wen must enter into the heart of those he knows have kidnapped him in order to save Sammy. The story is about family and loyalty, even several hundred years in the future. My usual rule for how I gauge the level of writing is whether or not I feel invested in the happenings of the protagonist. I found myself rooting for Wen in the search for his brother, and the battles and weapons that Wen is able to create in his virtual world is a unique twist on the "jacked in" theory of future technology. There's some twists, some surprises, and I look forward to more from Benoit! The classic story of the deposed rightful Duke of Milan Prospero and his daughter Miranda who are exiled to an island until Prospero's magic gives him the opportunity for revenge. 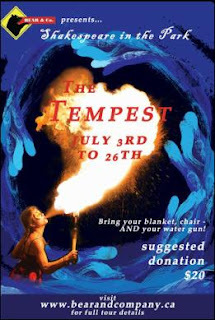 Many years ago in high school, The Tempest was the first (and for years, the only) Shakespeare play that I liked. I think it was perhaps the language and scenes within the play were something that I could understand without much "translation". I knew what was going on so the story stuck with me. Then, just a few years ago when I had my interest in Shakespeare re-kindled, The Tempest was one of the first plays I re-read. It has always held a special place for me as my gateway back into Shakespeare as an adult. I first became aware of Bear and Company last year when I first saw them perform the Comedy of Errors. After seeing several high-production plays in Stratford, Bear and Company were one of the first to show me the "Shakespeare in the Park" experience where troupes use little more than an occasional chair or table as a prop (apart from costumes). I was hooked! I know it sounds corny, but it is true that the language of the play itself is enough to keep me invested and, when the actors are gifted, I found I didn't need much in the way of props and stage decorations to enjoy the experience. 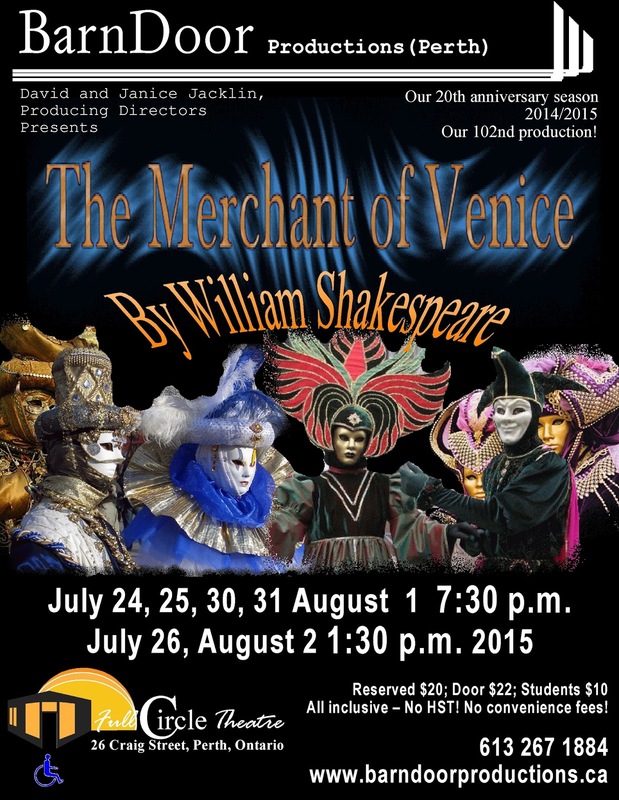 A really fun and well-done production that I saw in Kanata in Walter Baker Park (Behind the Ron Maslin Playhouse). The players make an effort to get the audience involved in portions of the play (though for this night everyone seemed to forget the suggested water gun to scare away the rogues and were forced into variations of barking). The interactions between Miranda and Ferdinand were fun to watch and performed in a way I hadn't seen before. Past plays always seem to have them act so serious, Bear and Company made them a little more flirty and fun which I enjoyed. Stand-outs for me were Hannah Leigh Ehman who played Miranda and Zoe Georgaras as Ariel. Ariel was a very interesting take as Ms. Georgaras obviously has some history and experience in fire-dancing which she incorporated into Ariels performances which was truly original and added to the effect of Ariel being "Magic". I wish they performed more than one Shakespeare play, as now I have to wait all the way to next summer to see what is next! But in the meantime, for other productions, Bear and Company also perform non-Shakespeare plays at The Gladstone Theatre.